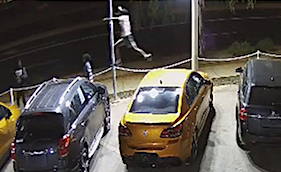 At 3.30am today rampaging Aboriginal kids were jumping from car to car, smashing glass on more than 50 of them and dinting and scratching them, causing hundreds of thousands of dollars damage. 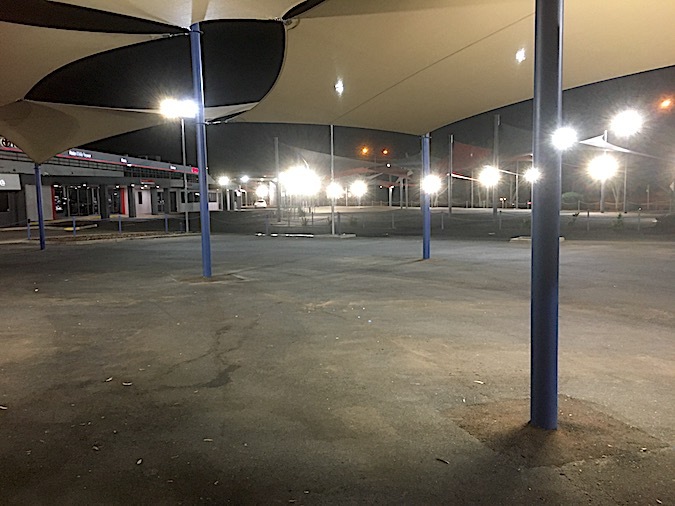 At 7pm there was not a single car in the sprawling display space of the Peter Kittle car yard which sells more vehicles than all other local dealers put together, and which is half Aboriginal-owned through Centrecorp. It clearly drives the police force commanded by Acting Deputy Commission Tony Fuller to its limits – and some locals say, beyond. He spoke the the Alice Springs News Online this evening. NEWS: Is there a strategy to deal with events like this, and if so, what is it? FULLER: We’ve been dealing with this for a long time. Strikeforce Winx deals with youth crime. There was a group of kids last night. We have since identified five out of the eight offenders. One has been arrested. We’ll obviously bring them before the courts or youth diversion, depending on the age of the child. NEWS: What about prevention in the immediate future? FULLER: They are targeted quite regularly with patrols. We also have youth engagement officers out there. This happened at 3:30 in the morning. We are ramping up for the Show. A lot of our officers are rostered on for the Show weekend. NEWS: There is a CCTV police trailer with cameras in the middle of the highway. Did they not pick up anything? Because that’s where it happened, under the nose of that trailer. FULLER: No, it didn’t actually, There was a lot of activity there and that’s actually monitored. Those kids were not in the view of that trailer when they were committing offences. We can only monitor what’s going on and react to it. We responded. NEWS: In terms of ongoing strategies, obviously the current one is not working, is there a new one in the making? FULLER: We can only do so much. Those kids are out at 3.30, four o’clock in the morning. They are not our kids. We can only react to what they are doing. On the prevention side of things, we can only engage with them as much as possible, and steer them in the right direction. At the end of the day, we can’t lock them up when they are out and about in the street. NEWS: Would you be in favour of introducing a system for kids that is similar to adults who get locked up for their own safety, if necessary? It’s called protective custody. FULLER: That’s a government policy issue. I wouldn’t comment on that. NEWS: Would you give me your personal opinion? In a media release today Acting Deputy Commission Fuller said since the start of May 2017 Strike Force Winx has arrested 47 youths and laid 226 charges. In the two-week period alone from 7 to 21 June 2017 Strike Force Winx officers arrested 31 offenders, who were charged with unlawful entry and other property offences. 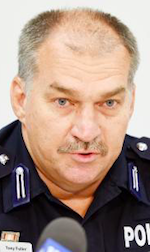 “Alice Springs police have 25 members dedicated this week to policing youth activities and events, with a further dedicated operation established to police the Alice Springs Show,” he said. The way this country is going it is only a matter of time before there is Sharia law and then and only then will there be justice that at the moment neither black or white people seem capable of dishing out. No it is spot on subject as the control and punishment of criminals in this country is little more than non existent. On the bright side these little criminals are damaging something that is part owned (in name anyhow) by their own and they are through their criminal acts providing employment to many trades and professions (except the police as they are doing little to prevent it in the first place). Want to rubbish what I have wrote? Go ahead as in doing so you are showing that your attitude is part of the problem. @ Michael Dean: I hardly see that it’s a police issue. Remember the police are funded by the taxpayers, but it’s down to the pollies as to how much funding they receive. If they lack resources, they should receive more, to employ more staff, hence more patrols. But then it’s down to the judicial system versus the do-gooders. We’ve all seen how that goes. As for your comment on responsibilities, how about laying the responsibilities back where they belong, at the parents! Where do people get off on shirking their responsibilities as parents? In my time, I have seen the parenting responsibilities go from the parents, to the schools, then the police, then to the employers and now its a societal problem. So given the circle of life, it surely must be the parents’ turn again! The police are only human, they can’t see into the future and their hands are tied in that the only time they can actually do something is when an offence is actually being or has been committed. They have a whole town to watch over, it’s not as if this area is the only place this happens, it happens all over town. When the police can catch them, they often get let off by the judicial system (and when the judges don’t just let them off they get criticised). More pressure needs to be put on the parents who let kids wander the street at all hours. The kids need to have consequences for anti social actions. Blaming the police isn’t helping the situation. I’ll bet they feel the same sense of dispair and discouragement that we do. I don’t know the answer, but I do know it doesn’t involve blaming the police. I lived in Alice Springs from 1966 to 1970. Even then, you could see how the situation was deteriorating. Was sad to leave as made a good many friends. Not an inspiring response from the Acting Deputy Commissioner. Effectively there is no strategy or plan B to look to even though we can see the current one isn’t working. Also, before any major event he has now confirmed that the Police need to “bank” their officers hours to keep to budget. So expect trouble prior. Being a Commissioner of Police has responsibilities, if you can’t fulfill them, then you should be removed and replaced with someone who does have a strategy. Remember the “protect” part of the NT Police motto.